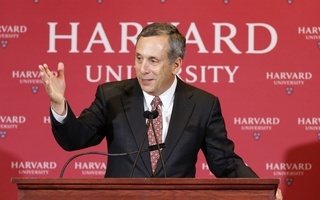 Traditionally, the point of asking questions has been to find out something you didn’t know before, and that’s why it’s so much fun that the Harvard Gazette joined the press conference announcing the selection of Lawrence S. Bacow as Harvard University’s 29th president. The Gazette is a wholly-owned subsidiary of Harvard Public Affairs and Communications, and so possibly the most interesting part of the presser for me was hearing what questions the University had decided to plant. In these carefully choreographed events, the choice of questions seems to suggest something deeper about Harvard’s intentions and concerns. This is no idle Kremlinology. The two questions posed by the Gazette—asking exactly how a searcher became the searched and how Harvard’s role in national politics may evolve—seem to offer a window into the minds of the search committee. The fact the 29th president was drawn from the Corporation itself—that the search committee picked one of their own—is symbolically representative of the continued ascendance of the University’s highest governing body as perhaps its only governing body. It’s easy to read this as another move towards centralization, especially when the press release took care to mention Bacow’s previous efforts to better knit together Tufts’s eight schools. Whatever the concerns some faculty or deans may have about the pooling of power in Mass. Hall, it’s hard to construct a more qualified resume than leading the faculty at MIT, becoming president of Tufts, and serving for seven years on the Corporation. He knows both higher education as well as the particular problems, potential, and people of this place. 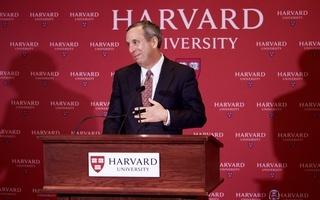 Quite apart from Bacow’s symbolic position in the institution, he may be the best person to lead Harvard forward. Yet if indeed the Corporation is an excellent training ground for the presidency, it seems likely this will not be the last such president-née-searcher. By contrast, the second question seemed intended for a broader audience, perhaps one less concerned with Harvard org charts and more worried about liberal snowflakes. In what seemed to be a reflection of Harvard’s problems with the federal government and popular perception, the Gazette’s question—and much of Bacow’s broader message—surrounded the University’s reaction to the political climate. We live in a political moment when both immigrants and Rust Belt workers feel shut out of the system, where Harvard seems politically under attack by a Republican White House and Congress, and where there’s been a resurfacing of the old charges that there’s something vaguely un-patriotic about what’s going on in college campuses. These represent some of the biggest threats facing Harvard, its finances, and its people, so I am glad that Bacow has continued Faust’s emphasis on tackling those challenges head-on. For now, his only vehicle is rhetoric, and he begins by accepting some of the criticism, presumably conservative, as “fair.” What comes next is a veritable fusilade of reflections on contemporary threats to the American dream. Indeed, the official video released by Harvard pairs three minutes of exposition about the uniqueness of Bacow’s American story with swelling music that would do Aaron Sorkin proud. It’s all decidedly flag-wavy, and it tells an only-in-America story about Bacow that seems intended to cover Harvard and more broadly higher education in the blanket of patriotism. Bacow’s resume almost positions him as an elder statesman of higher education, and his frequent references to shepherding American universities through the dark years ahead have echoes of reasserting Harvard’s historical (though perhaps mostly self-imagined) primus inter pares status. These are all positive signs, and I am glad that Harvard’s 29th leader is so well equipped to understand, prioritize, and tackle these challenges. 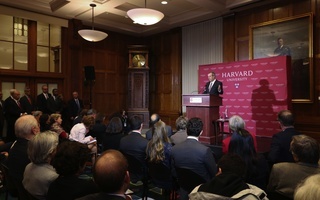 Political and economic turbulence demand greater engagement from Harvard. They require a leadership with the instinct and ability to decisively act on behalf of the entire University. 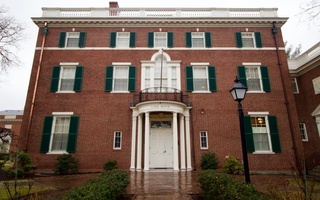 And a recognition of Harvard’s distinctively American history and character is not out of place. Ironically, when a Crimson reporter asked Bacow at the press conference about his top priority, he declined to answer, suggesting it was premature. Yet on Sunday, his answer, and that of the search committee, was fully on display. Derek K. Choi ’18, a former president of The Crimson, is a Government concentrator in Leverett House.